We are delighted to host a workshop on creative thinking by artist and best-selling author Rod Judkins. 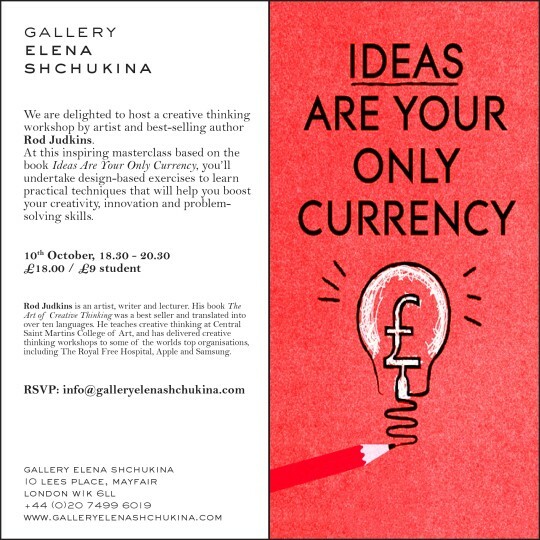 Based on his book Ideas Are Your Only Currency, the theme of the workshop is to understand the importance of ideas and how to create them. The real currency of our time isn’t money. It’s ideas. You’re surrounded by ideas. Films, products, books, music, messages, services and everything in your culture began life as a vision in someone’s head. If you have ideas, you’re at the heart of things. At this inspiring masterclass, you’ll undertake a series of design-based exercise to learn practical techniques that will help you boost your creativity, innovation and problem-solving skills. Rod Judkins is an artist, writer and lecturer. His book, The Art of Creative Thinking, was a best seller and translated into over ten languages. He teaches creative thinking at the world’s most innovative university Central Saint Martins College of Art. He has delivered creative thinking workshops to some of the worlds top organisations including The Royal Free Hospital, Apple and Samsung.